We’d love your help. 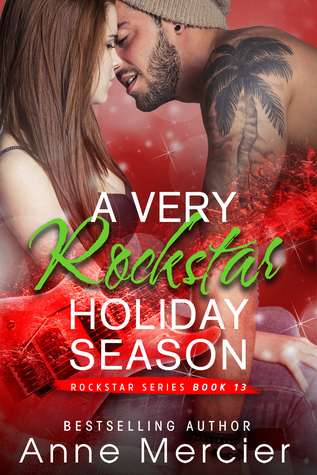 Let us know what’s wrong with this preview of A Very Rockstar Holiday Season by Anne Mercier. Have you been wondering about Ben and Nicole? Well, let's take a little look into their lives now and see what's going on. To ask other readers questions about A Very Rockstar Holiday Season, please sign up. Oh my god, this one will have you in tears by the end. Good tears, but tears none the less and oh so much hope! If only all kids had this kind of ending! I love the novellas that Anne Mercier gives her readers in between the more meatier stories. They give us a chance to catch up with our favorite characters which is always one of my favorite things! A quick read, A Very Rockstar Holiday Season gives us more Ben and Nicole and it's the perfect thing to whet our appetites as Mercier gets ready to deliver her next BFD novel. What a beautiful short story & so worth the little wait!! Ben & Nicole have faced SO much in their relationship already, so to view her heartbreak at facing never being able to carry Ben's child or children is painful. As we've come to expect with this insightful Author, Our couple come together & face the dilemma head on, with honesty & heart!! Most of the 'Rockstar' characters pop up for minor cameo appearances in this book which is always a delight 😊 But the main focus stays o What a beautiful short story & so worth the little wait!! This short story proves Anne Mercier has in no way lost her writing mojo, her heart or skill at drawing the reader into the worlds she writes for us. Ill health is & probably will continue to hinder her writing output for a while but clearly not it's quality!! Patience isn't often in our hearts as readers but in this case I say ... Take all the time you need to make the books into what you are happy to print Anne, we'll read them once they're out as long as the quality is there, which it is!! Stay strong, ignore the pushy people & produce the quality work we all love to devour!! This story is short, fast paced and festive. I read this book in one sitting and wasn’t once bored. I was left wanting more. I really enjoyed catching up with Nicole and Ben. The love between Nicole and Ben is still going strong and the chemistry between them is still undeniable. Without giving too much away, my heart ached for Nicole and Ben. I truly wanted them to get what they wanted. I also liked that certain characters from Jase and Summer’s story (Kadence) were in this story. My only disap This story is short, fast paced and festive. I read this book in one sitting and wasn’t once bored. I was left wanting more. I really enjoyed catching up with Nicole and Ben. The love between Nicole and Ben is still going strong and the chemistry between them is still undeniable. Without giving too much away, my heart ached for Nicole and Ben. I truly wanted them to get what they wanted. I also liked that certain characters from Jase and Summer’s story (Kadence) were in this story. My only disappointment was that this book wasn’t longer, I wanted more. The storyline for this book is easy to follow and an enjoyable read. I cannot wait for more from Anne Mercier. Every time I read one book of hers, I am left wanting to re read the whole series again. I have lost count on how many times I have read the books from this series. Short, emotional and some questions will be answered. Colely and Ben’s story continues after Ballad and through the next books, this novella gives you insight on their journey and coincides with the timeline of Kadence. To fully understand and appreciate this novella you need to have read the Rockstar Series through Book 7 Kadence. Anne Mercier knows how to pack a punch in this novella. I had tears rolling before I even really got into the heart of the novella. There were giggles and heartfelt m Short, emotional and some questions will be answered. Colely and Ben’s story continues after Ballad and through the next books, this novella gives you insight on their journey and coincides with the timeline of Kadence. Ben and Nicole are so perfect for each other and I was wondering what was in store for them. So glad that we got a follow up with those poor kids... yay!!! Well Anne you never disappoint me I love each of these Rock star book and I can't wait for more. God only knows what trouble we will see in the next books to come, I can't wait to find out who.has all the mojo besides Nana.R..... oh I love this group. Who doesn't want a quick check-in with our Rockstars? In this, we get a short peek into the life of Nicole and Ben. What are they up to, how is Nicole feeling; find out here. What I loved, besides the obvious, is the little stories about our Rockstar children. The K-quads and Kadi. Have I mentioned how much I love these Rockstars?! OMG this nearly killed me. I spent pretty much the entire 4 chapters crying my heart out. Anne has done an amazing job with this short story and I cannot wait for more from all the rockstars crew but especially from Ben and Nicole after this. Wow the feels I love that Ben and Nicole are going to get their little family too! Anne you never disappoint with an amazing heart warming read I adore you and your writing. I can’t wait for Xander I just know it will be Epic. So for all you readers out there if you are reading this review to see if you would like it get it you won’t be disappointed these books are everything you want in a book. This is a short but sweet little story. It’s nice to get a flavor of one of my favorite Rockstar couples. Looking forward to the Xander book next on the agenda. I absolutely love these characters so much. This little piece of the story just gives us a little more insight. <3 Ben and Nicole. What a wonderful glimpse into Ben and Coley's life. For such a short story it pulled hard at my heart strings. Both in a sad and happy way. I can't wait to find out more through future books. Well done Anne. Such a great short story! I loved being able to catch up with Ben and Nicole. And I loved the connection between the children (from a previous book) to Nicole and Ben. Loved this book even though it was so short, we got to see what's been going on with Nicole and Ben... can't wait to read more about them being Foster Parents! This novella is so sweet Ben and Nicole are so cute together I can't wait to read more about in the books to come. Another great job Anne Mercier you never let me dowm. Love reading the series. Can't wait for more to come out. I can never get enough of them!!!!!! I am always rereading them!! I love Ben and Nicole! Love Anne Mercier! This series is the best series ever! Can't wait for the next book!! I have read this whole series Twice maybe have to read again!! Read this in under half an hour. I would love to read the rest of this story hopefully soon this was just too short for me! I want more! A gorgeous sweet short story, beautifully written, which gives us a peek into the lives of Ben and Nicole. Poignant at times, it brought a tear to my eye but also warmed my heart. Just lovely! Short but extremely sweet!!!!! I loved this holiday novella, a quick check in with our beloved Rockstars, thier kids that we can't get enough of and a couple of sweethearts that we were worried about. And I adored hearing more about Ben and Nicole, two of my favorites!!!! Love love loved this quick check in!!!!! Can't wait for more Anne Mercier brilliance!!!!! Love love love this little snippet of Ben and Coley. I loved this quick read. It updated us on what's happening with Ben and Nicole. I can't wait for more. What a joy to get a sneak peak into the lives of our favorite rockstars! And especially Ben and Nicole. I’ve adored them from the beginning! And now they get their beginning and end and happily ever after! There are not enough words to describe the love I have for his rockstar family!!! Loved this little story to bring us up to date on Nicole and Ben. Thanks Anne. Hope is a great word. An perfectly wonderful short story to update us on Ben and Coley with just enough of the rest of the"family" to tease us for Xander's book. Anne Mercier is the International Bestselling author of adult contemporary romance, new adult contemporary romance, and mature young adult romance. She was born and raised in Wisconsin and still lives there today. When she's not writing she enjoys reading amazing books, listening to music, keeping up on all things Avenged Sevenfold and Milo Ventimiglia, chatting with readers and friends, and bingi Anne Mercier is the International Bestselling author of adult contemporary romance, new adult contemporary romance, and mature young adult romance. She was born and raised in Wisconsin and still lives there today. When she's not writing she enjoys reading amazing books, listening to music, keeping up on all things Avenged Sevenfold and Milo Ventimiglia, chatting with readers and friends, and binging Netflix series.